Kimera Way has played a crucial role in some of the biggest headlines impacting UW-Eau Claire – and the Chippewa Valley as a whole – in recent years. Through her positions overseeing both the UWEC Foundation and the Blugold Real Estate Foundation, Way has had a hand in the Confluence Project, the proposed Sonnentag Event and Recreation Complex, and even the creation of Blugold Radio. Add to that working with major donors, focusing on large-scale real estate projects, advising Chancellor James Schmidt, serving on the university’s executive staff, and working with the foundations’ volunteer boards, and Way’s agenda is always full. “No two days are the same, and often what I think I’ll be doing when I come to the office is totally different from what I end up doing,” she says. 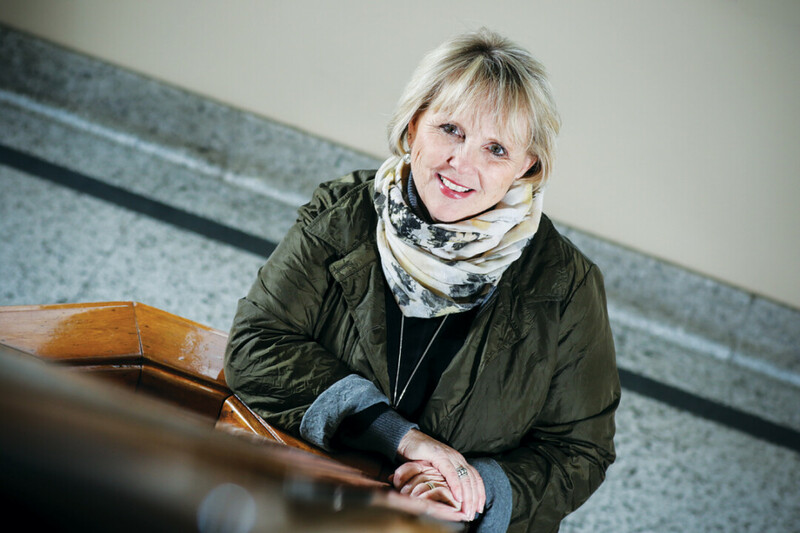 “I’m never bored.” Way came from Michigan Tech University to UWEC in 2001 to oversee the university’s first fundraising campaign, becoming executive director – and later president – of the UWEC Foundation. (And in keeping with the university’s “Power of AND” slogan, she holds two other titles: executive director of university advancement AND executive director of the Blugold Real Estate Foundation.) Through her multiple roles, Way is constantly seeking ways to improve the university. “My favorite saying is when opportunity knocks you can’t say no one is home,” she says. “You also have to be willing to ask and also be willing to say ‘yes.’ ” Way talked with Volume One about her multiple roles supporting the university, why women are better at owning up to bad decisions, and the fallacy of maintaining a perfect family and career. Volume One: The shorthand description of a university foundation is that it raises money for a university. What else does the UWEC Foundation do that people might be surprised to learn? We work with donors who want to give “things” – like an extensive jazz collection, Southwestern pottery, and the Robert Frost Collection. I’m dating myself but I use the analogy of Yenta the Matchmaker in Fiddler on the Roof: Our role is to build relationships with individuals/entities who have the ability and desire to be philanthropic and then match them up with the needs of the university. The UWEC Foundation has played a leadership role in a number of major projects, including the Confluence Arts Center. Has the success of the Confluence effort helped build momentum for the future of the foundation and the university? Certainly the work on the Confluence project has caused people to look at the foundation in a different light and opened up conversations for other opportunities. I’ve been approached a number of times since we embarked on the Confluence journey about other real estate projects. Not all of them fit into our strategy nor do they meet a pressing need of the university. We have a risk assessment/management committee of the foundation board, and every project that isn’t strictly receiving gifts for specific funds or projects has to meet a litmus test regarding the “WHY” we would do something. I’m sure some of the gifts we’ve received since the Confluence wouldn’t have come to us if people weren’t aware that we did think creatively and look for opportunity. In your role you move among leaders in the public and private sectors. As a woman in a leadership role, do you find yourself perceived or treated differently in these different spheres? I’ve been lucky in my career in that I’ve never really felt that I’ve been treated differently because I’m a woman. There are a few times, and I usually laugh when happens. I’ll say something and it goes by people at the table and then a man will say pretty much the same thing and it’s the greatest thing in the world. You just can’t focus on those things. I guess I’ve been in a fairly male-dominated leadership role for so long I just never worry about if someone says something that could be perceived as a slight. When I started in this work I was so much younger than anyone else, I was more worried about not having credibility because of my age, not my gender. I don’t have to worry about that any more, I guess. Do you believe you make decisions, big or small, differently than a man would in similar situations? I think I tend to look at the nuances of things more to take into consideration how the outcome is going to look to different populations. Honestly, I think my decision-making has changed more the older I’ve gotten not necessarily because I’m a woman. I tend to be someone who makes decisions quickly. I learned from a great mentor who told me that whatever decision you make is the right one, so I tend not to look back to say “what if.” I also learned that you have to own your decisions and that you can’t pass on your mistakes to others. One thing I do that I don’t think men do very well is if I’ve made a mistake I’m quick to admit I screwed up – I accept responsibility for my mistakes and look not to pin blame on anyone but to figure out how we can avoid doing that dumb thing over again. I think women tend to be more willing to accept and own their mistakes then men. What advice would you offer to young women aiming for leadership roles, whether in education, business, or philanthropy? Still, I’ve worked really hard and probably still shortchanged my family. That said, I think my kids have turned out pretty well, and I think I’ve been able to do OK at work, too. You just have decide what you can and can’t live with and then build and live your life to those standards. I think we live in this world where we expect everything we do to be perfect. Women especially are hard on themselves and each other about this idealized version of perfection. Once you get over that notion that you won’t have the perfect children and the perfect job, your mental status and life will be much better. We have to decide where to place our energies where they are going to make the most difference to us and to those to whom we owe a level of responsibility. We also have to be willing to accept that some days our best work is only average. I keep focusing on trying to do the very best I can and if it falls short of other’s expectations, so be it. I also would advise young women to seek and rely on mentors – I don’t think women mentor each other enough. I’m blessed to have a tremendous mentor in a former boss who still is a key person in my world. Take risks. Unless you are a brain or heart surgeon if you make a mistake it’s likely going to be OK. Be willing to take some risks in areas where the consequences aren’t that grave and if you fail, learn from that and move on. Finally, create a close network of friends who will have your back and you will have theirs. You really need people – especially other women – who are your champions and who have your back. I can count on two hands the number of days in my career where I didn’t like my job. I’ve been blessed to do something I so love, to hopefully make a difference from time to time, and to work with amazing people. You just can’t beat that.